I'm having a hard time figuring out what type of tree this is. It bears fruit, small and dark red. Someone said it was a cherry tree and someone else a plum tree. Last summer, it bore plenty of fruit, more like a small plum, but it was pretty hard so that confused me a bit. 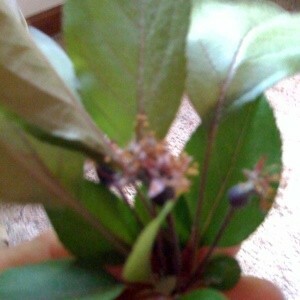 The picture is one I just took of the leaves and the newly forming fruit on it. Oh, it was covered with pinkish purple blossoms not too long ago. Maybe your county extension office can help you. Good luck. Looks like it may be an ornamental crabapple. The fruits are not for human consumption. kffrmw88 is right, take a sample branch into your extension office, (or a friendly local garden center) and ask for help in identification. Thanks shishi! I do believe you are right. When I cut into the fruit last year, it was very apple-like. After looking at pictures, I believe you have helped me figure it out. Thanks again.